Make portion control a breeze with our collection of portion spoons! 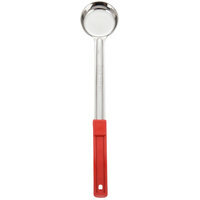 This 2 oz., solid, red portion spoon is one-piece and can be used to measure food for both wet and dry portion control. It has a color-coded handle for easy identification and kitchen organization! The colored handle eliminates the stress over spending too much time searching for the right spoon. This 2 ounce spoon is of exceptional value! I have tried many similar types in the past, but I find that these hold up well. These have helped us with fixing our food Cost issue. We used to use just any scoops. I have made it standard procedure to use these 2oz scoops for the toppings on our tacos. It creates consistency with our numbers & consistancy for our guests by knowing the correct portions. Good size for portioning sauce on personal pies (like an 8-inch for example). The notch on the grip handle is great as it keeps the spoodle from falling into the sauce bucket. Only 4 Stars because the spread that this gives tends to be streaky. But for the price, can't complain too much. These portion spoons are exactly what they are described to be. I can’t seem to find an application for them that works for me, so for now, ill just have these lying around the kitchen! I am sure they will come in handy one day. Portion spoons are a very important tool to have in your kitchen. Use these spoons to keep your recipes consistent and your guests happy. Color coded to keep them organized. These are perfect for serving, even when precise portion control isn't necessarily a concern. Love the color coded handle for easy size identification. This size is the first in my kit, but will be adding others as needed. We use our 2 ounce portion spoon for our BBQ. It sits in a hot pot for quite a few hours and the quality of it has held up. We love having different ounce portion spoons because it takes all of the guesswork out of how big the portions are. Employees tend not to over-portion when using these. I also love how they all have different colored handles, which makes it easy to grab for the spoon you're looking for. This is perfect for portioning sauce. I use it to make sure im always giving same size portions to every customer. I love that its nice and sturdy and color coded. This 2 oz serving portion spoon is great for serving a variety of foods. You can used for perfect portion every time and price was affordable. Excellent Product , two ounces spoon really great for food control , well made and the its cheaper than lot of places out there i will definitely buy more of it . Portion spoons like this one piece spoon are essential in food cost control. With this two ounce spoon we will know exactly what and how much we are serving. This spoon is perfect for portion control. I use it to scoop out oatmeal. It's easy to clean and has a sturdy, easy to grip handle. Great portion control. I use this portion spoon everyday in the pizzeria. It holds up really well, no breakage or separation on the handle portion. The two ounce portion spoon is perfect for portioning out our marinara sauce for our house made pizza. It is easy to use and easy to clean. Great quality at a Very great price. This is a very sturdy spooled that is perfect for exact measurements. Perfect for use on a trayline in nursing homes. Holds up great in a commercial diswasher. This 2 ounce solid portioning spoon is the smallest size in this line. It is made of one solid piece and is very durable and easy to serve from. It is also easy to clean and is dishwasher safe which we really love. There is also a perforated 2 ounce spoon in this line but this is the solid version for serving liquids with your food item. Nice size to reach in bigger 5 lb containers. Handle is long enough so spices don't get all over when lifting out. Have to order the 1 oz spoon when it becomes available. Extremely small, but this is really is really good for things like dressings, chocolate sauces, pizza sauce, etc. Also very easy to clean. You can just stick it in the dishwasher. These are long spoons. They help to dish out just the right amount and per plate. They are also good to help with even baking. I ordered them in all available sizes. I make a sugar-free fat-free hot cocoa mix and store it in a half gallon canning jar. I was having a hard time measuring the 1/4 cup serving once the contents dropped down to about half, so looked around for a portion spoon with a longer handle. This one gets all the way to the bottom of the jar with no problem. Although I really wanted one that stored in the jar, which this one is too long to do, this one easily solves my problem. I bought 4 of them so when some were in the dishwasher, I'd still have a clean one available; since this one can't stay in the jar I have to wash them after every use. But at the price, it was no problem to buy 4. I was concerned the handle would be flimsy, but it's sturdy and not flimsy at all. Great product for the price! I ordered several for our serving lines. We needed some for our elementary schools. Works great for the little clients we serve. Not a bad 2oz one pice portion spoon. Has a nice comfy hanle to it. And is a cheap price in this site. Good for portion control! Use these for portioning my pizza sauce on my pizzas. Love the flat bottom so it spreads evenly. Very durable and has many options for storing them. The price is great from Webstaurantstore.com. These spoons are very useful on the steam table. They not only help with serving portions but they don't get hot while on the table. This 2 ounce one-piece solid portion spoon is exactly what I needed for portion control measuring. I cook food in bulk [to save time] and freeze in aluminum containers. In the past I always had to wait until the food cooled off because I don't like to measure with plastic or hot burning metal measuring cups. The plastic would warp and the metal would burn my fingers. Not anymore! The handle is long enough to scoop the food out of the pots- works quickly to do assemble line portion and I freeze my entrees so I have them later. It is time saver item. We love the colored handles to easy identification. Easy to clean, great to use in kitchen and buffets. Great purchase and fast delivery. We got a zillion in all colors! Very sturdy construction. I'm fae.irly certain these products could survive and explosion and still serve food well. I'm glad I bought a bunch as they see constant use. One of the nicest utensils on this site. The 2 oz. One-Piece Solid Portion Spoon is perfect for many tasks. You will wonder why you waited to get one. This spoon works great. Easy to clean, and very durable. Product scoops out cleanly. I use it to portion out refried beans on nachos and it does the job. You can use the 2 oz. One-Piece Solid Portion Spoon to serve kale. It is a great size. Great for serving the little ones. After serving them you know they got at least 2 oz worth of healthy kale with the juice, which is also great for adults. This 2 ounce solid spoon really made it convenient to serve sauces and control portions. The handle was curved very comfortably and was easy to hold and serve. A great portioning spoon. It has a great handle which is color coded so we know the ounce size by the color of the handle. Very sturdy and durable. I will never buy another portion spoon again! I bought the 2oz, 4oz, 6oz and 8oz. Portion control has never been so easy, from making smoothies to baking to serving. This spoon is great! Skeptical at first with the length of the handle, but it has been awesome. I have bought one for home use! Colored handle would be nice for prep, we only use one at the store though for dry goods. Only back remark is that the adhesive from the "UPC" sticker was a bear to get off of the bottom of the spoon. Great spoons. Perfect portion control and heavy duty. This is a must have for gatherings when you want to control the portion of food to be dished out. We have been using these serving spoons about 2 years and they are super! Very easy to serve correct portions to our kids! Thank you! This is a Perfect scoop for portioning out mixtures for my sandwiches. It has a very sturdy handle and an easy grip for my fast pace work environment. STOP LOOKING FOR A SPOON FOR YOUR PIZZA SAUCE! This is it! Great flat bottom for easy spreading - perfect portion for a 10" pizza (at least for us) - easy to clean & keep clean + if you need to use more than one size, they're color coded for easy reference. No brainer. This is the only spoon I will use from now on. These smaller portion control spoons are great for when you have multiple sides to put on a plate. bigger spoons have people put to much on their plate when there are several sides to choose. I volunteer at a lot of local food pantries and this one-piece portion spoon was a great inexpensive tool for equal portioning of food!! Buy a few and control your costs! It would be a good cafeteria item too!!! This 2oz spoon is perfect for serving yogurt, dips, dressings, sauces, and gravies. Well-made spoon at a reasonable price. Portion spoons minimize food waste and come in handy when serving a large crowd. I like that they are color coded for sizes. This two ounce spoon is great for sauces or gravy and excellent for kid sized portions. The best way to know how much you spend on food is to measure with these.